Everyone I know keeps asking me, “What are you growing in your greenhouse?” So for this post, I thought I’d try something different: less words and more pictures. First, this is the greenhouse/potting shed. I started most of the seeds in February. This, of course, depends on the seeds. I will break up the planting schedule based on germination time, bloom time, and last frost date. See the Library page for my guidebooks. There is a space heater in there, as well as heat mats for the seedlings. I have hung plastic to keep the heat in the growing area; the other area is for storage of yard equipment. The best times are when it’s snowing outside, and I’m in the shed in 75 degrees. There is no running water, so I carry water in. This has been a cool spring, so the heater has stayed on longer than usual, especially at night. In warmer weather, I take down the plastic, open the Dutch door, and realease heat out of the vents up top. I purchased the seeds through Park Seed. Usually, I purchase seeds through a variety of sources, but this year I felt the need to simplify and save some money. Ordering from less catalogs meant less shipping and handling charges. Now for the seedlings. Hope you enjoy them! I love that greenhouse! will send you a pic of our greenhouse. any ideas on watering seedlings without having to run in and out 3x a day. i was thinking of some type of mist system, but have not seen one that is not complicated. My problem is that I didn’t want to go to the hassle of running plumbing and water out to the shed. I worried about having to drain lines to prepare for winter, which is when I would need the water. So, I settled on some large watering cans and carrying the water into the greenhouse. When just starting the seeds, I tend to water from below to avoid compacting the soil. When the seedling sprout, I will also mist the leaves with a spray bottle. For more humidity, I’ll fill a tray with water and let it evaporate. do you have a plan you can share for the greenhouse/shed? I love it. Hi Lori. Thanks for stopping by and visiting my potting shed. My partner actually designed the shed. He drew the plans on a yellow legal pad. The shed roughly measures 10′ x 10′, and the ceiling is about 12′ high. There is a loft space on the door side. I’ll see of I can find his original drawing and get it to you — if not, I’ll ask if he can draw it again. There isn’t any heat or running water, but I do use a space heater and heat mats. I too would like the drawing! This is exactly what I’ve been looking for. My husband is a carpenter so with the drawing I’m sure we could make this happen! Hi Marlene. If you go to the post “The House That Joe Built,” you’ll find all that you need. Hope this helps. I truly love this shed. Are there plans online to build it or a purchase kit? Thank you for your response. Hi Marlo. The shed did not come from a kit — it was designed by my partner and we built it from scratch. I’m glad you found my site and the shed — it’s truly my therapy place, even when things aren’t growing in it. I’ll look for our actual sketches. Hopefully that will help you out. Thanks for commenting. I have to echo the previous comments, truly wonderful building, great design and choice of building materials. Would love to see the design for this. Much Kudos to your partner for this build. I feel more relaxed already. Hi Joe. My partner’s head is starting to swell with all of this attention. 🙂 The shed, though, truly meets my needs. Right now, we’re searching the house for his original sketch. If we can’t find it, we — and when I say we, I mean him — will draw up something more specific. Thanks for commenting! I had a greenhouse at our last house. We built a salad table for it. It was a potting table, sort of, that had about four inches of soil for growing lettuce in the winter. You need one! Hi Vicky. I agree. Friends of mine have tables like that outside, where they grow salad and herbs. It’s certainly easy on the back! Definitely something on my wish list. Thanks for commenting. I too luv your Shed, I could make it my plant / readin place,,, would luv a copy of it if possible please.. Thank You. Hi Lady Di. Thanks for your kind words. All of the shed details can be found on the Potting Shed link just below the header. Hope this helps. your partner must be very talented. was the greenhouse was added on to an existing shed? or was the shed/greenhouse constructed at the same time? the greenhouse light panels are glass or plastic? Hi Dennis. Yes, he’s talented — and he had the idea to build the potting shed and designed it. We built the whole structure from scratch on a cement block foundation. It has a patio block floor, except where the growing is done. I used gravel there, so any water can drain. The panels are glass, 16 inches wide so that they fit in metal tracks that are attached to the 2 x 8 roof rafters and 2 x 6 wall studs. Since there’s so much interest in the shed, I will try to put together a post together that is shed specific. Be well. Hi Brenda. Thanks for stopping by. Good luck with the renovations. 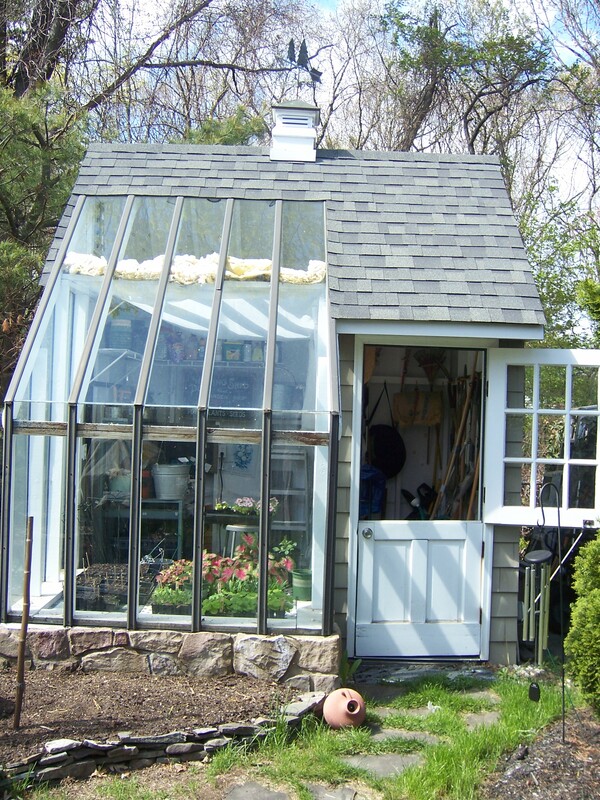 A greenhouse added to your shed would be spectacular. Be well! Have been working toward this end for a couple years collecting windows and doors. Your sunshed is everything I want……I just don’t have the building know how to get started. Hi Kady. I’m so glad you liked my potting shed. I’m working on Joe (since he’s the builder) to get some info together for everyone who is interested in the shed. Be well. I love your shed!! I think it would be perfect for us. I can see this post is old, so I was wondering if there is a plan on this page already? Hi Jelena. I’m sorry I do not have an actual plan. My partner actually came up with the idea and built it from scratch. I’ve been nagging him to put something in writing so I can share it. Thanks for your comment. Oh, you are welcome. Its a pleasure to see something so practical and beautiful! You don’t need to pester your partner for the plans, I know its time consuming to draw them. But could you post a few more pictures of the sides perhaps, and rough dimensions? We have all the material (except glass), and I was looking for something I like for a long time. Its a perfect combo of storage and greenhouse that we need in our garden and to top it it looks perfect! Your shed is so beautifull. With a little help I think someone can make this for me. Could you send me measures? Height? If you have a plan, that might be an enormous help, but if not some good advice could do too. Thank you ahead of time for when you post the design of the shed. It truly is a well designed and thought out structure. Hi Tommy. I’m glad and flattered that you like the shed. It’s pretty simple and suits what I need it for. I’ll nag Joe about drawing actual plans for readers. Hi Rich. I owe you a) an apology for taking so long to get that post completed and b) a big thank you for lighting a fire under my you-know-what to get that post done. As we speak, Joe is outside measuring every inch of the shed so he can draw it all out. The post is definitely going to happen soon — and I will keep it as a page on the blog for easy reference. i have a similar green house. My problem is the heat during the summer. Our panels are glass and do not open. Any recommendations? Hi Laurie. I always had that issue in the heat of summer. The glass panels do not open. But vents in the attic/loft space, as well as keeping the top half of the Dutch door open kept it cool enough for me to walk in. If you have electricity in your send, you may want to set up a fan just to keep the air circulating. In the summer, though, there’s really no need for me to spend too much time in the potting shed. The green stuff is outside. I really needed it to be warm in the other three seasons. Hope this helps. Is the drawing finished by now of the shed? If so I would love to have a copy and thank you to you and your talented buddy!